This November, set sail for the adventure of a lifetime in a Dove-approved treat for all! 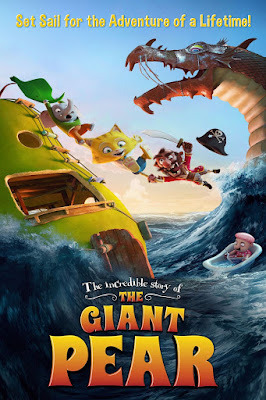 Prepare for giant laughs, giant adventure and giant thrills when The Incredible Story of the Giant Pear hits VOD! An elephant named Sebastian and his best friend, Mitcho the cat, live in the cozy coastal village of Sunnytown. One day the beloved mayor of the village, JB, disappears! While fishing, Mitcho catches a bottle and in it is a message from JB, who says he is stranded on a mysterious island. They set out on the adventure of a lifetime to find this mysterious island and return home safely with JB. Directed by Philip Einstein Lipski, Amalie Næsby Fick and Jørgen Lerdam, The Incredible Story of the Giant Pear is available on Demand November 13, 2018 and DVD January 1, 2019 from Uncork’d Entertainment.